Why does the north star always point north? 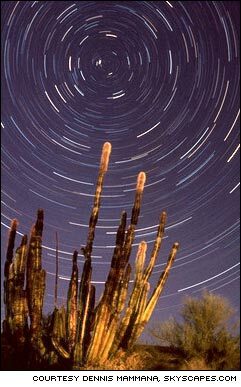 Polaris, the North Star, appears stationary in the sky because it is positioned close to the line of Earth's axis projected into space. As such, it is the only bright star whose position relative to a rotating Earth does not change. All other stars appear to move opposite to the Earth's rotation beneath them. At the North Pole, Polaris would appear directly overhead with the other stars circling around it during the course of a night. As you move south, away from the Pole, Polaris would appear further down in the northern sky but still be at the center of daily stellar motions around it. There is no bright star overhead at the South Pole, so no 'South Star' equivalent currently exists. The North Star, however, will not 'always' point north. Because the Earth wobbles like a top in its orbit, Polaris will eventually appear to move away from the pole and not be the North Star again for another 26,000 years.